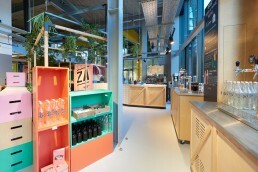 EAT17 is not your average convenience store. 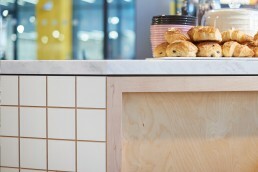 With locations throughout London and the South-East, they have become known for their mixture of daily essentials, alongside a dedication to promoting local food producers. 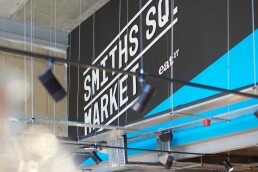 Having worked with Eat17 on a number of projects previously, we were asked to take a look at a location in Hammersmith, and create a new food shopping experience. Looking at the local market we soon realised that the affluent area benefits from the nearby transport links and a world class theatre, making customer footfall high well into late evening. 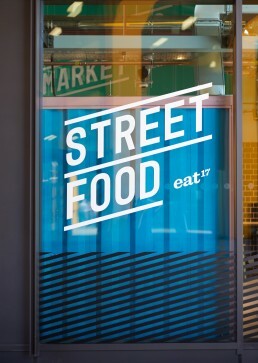 Capitalising on the popularity of casual dining, time poor commuters and theatre goers, we proposed a street food market combining 3 independent food sellers and an in house Coffee bar. 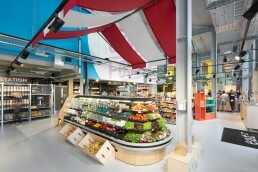 Customers can either eat in or grab food on the go, as well as do their daily grocery shopping. 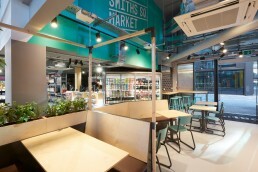 Introducing a fresh colour palette and a new graphic style, we created a cluster of corrugated containers along with a seating area linking the grocery store to the “eat in” space. 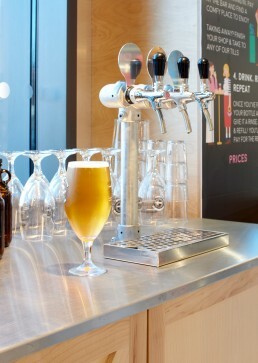 The new store combines several new experiences, including Refill stations for food wine and beer, encouraging the reduction of unnecessary packaging. 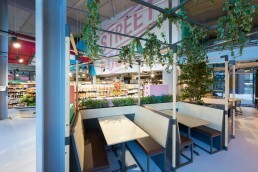 The overall result is a local grocery store that feels more like a vibrant open air food market.